If you dream of an empire at any expense and little more, you likely have been acquainted with perhaps the greatest antihero television has ever seen—and yes, we've seen The Sopranos. Walter White of Breaking Bad fame built that ever-elusive empire on the backs of those who trusted him and on vats of methylamine, eventually transcending his cancerous high-school-teaching self in favor of his daunting alter ego Heisenberg. Easy now, you're drooling. We understand your ambitions but we can only do so much, man. 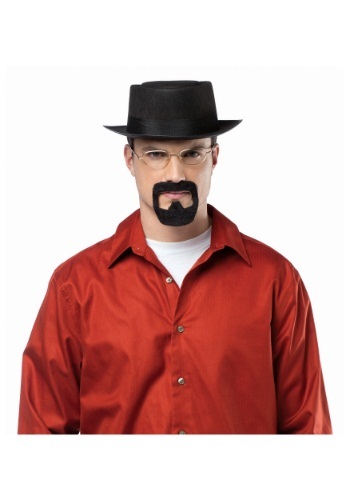 This officially licensed Heisenberg Kit is exactly what it sounds like, featuring the now-iconic black hat, self-adhesive goatee, and silver-tone wire-rimmed glasses. The RV, methylamine, and lovable high school dropout are sold separately, somewhere, maybe. But before you get any of this, you need to say our name.